Home / Retirement / 401k & Investing Tips / Will Advanced Micro Devices, Inc. (AMD) Ever Post Regular Profits? Will Advanced Micro Devices, Inc. (AMD) Ever Post Regular Profits? Advanced Micro Devices, Inc. (NASDAQ:AMD) recently released its second-quarter results and scored beats on the top and bottom lines. The report triggered Wall Street’s jubilee, sending AMD stock back toward 2017 highs, and shares are up more than 20% year-to-date. Still, while the company posted a 2-cent quarterly profit, AMD is still in the red for the trailing 12 months. And in fact, the company hasn’t reported a profit on an annual basis since 2011 — unlike many of its rivals. As a producer of both graphics processing units (GPUs) and central processing units (CPUs), Advanced Micro Devices occupies a somewhat unique position. It competes with Intel Corporation (NASDAQ:INTC) in selling CPUs and Nvidia Corporation (NASDAQ:NVDA) in GPUs. I’ve written two articles advising against buying AMD stock this year, raising concerns about its valuation, finances and (lack of) profitability. Last week, I also advised against buying Nvidia stock, seeing the GPU maker as priced to perfection. Yes, Advanced Micro has turned itself around since early 2016, when it came close to bankruptcy. But with AMD shares up 540% since Feb. 5, 2016, it seems most of the chipmaker’s improvements are being reflected (and then some) in the stock’s valuation. Since AMD isn’t profitable, I can’t compare it to other firms using metrics such as its price-to-earnings ratio. But we can look at its price-to-book ratio, which at 32 is well above peers, even NVDA. I can’t justify paying 32 times book value for a stock in a volatile, fast-changing industry that last posted a profit during former President Barack Obama’s first term. Why do profits continue to elude AMD? In highly competitive industries, firms have trouble capturing the value they create, which often goes to consumers in the form of lower prices and better products. Semiconductors are a very difficult, zero-sum industry. I described the industry’s winner-take-all dynamics in my article on June; only the leaders, such as Intel, earn profits. Less successful firms post returns lower than their cost of capital, destroying value for shareholders. High stakes ensure tough competition between rival chipmakers; price wars tend to break out every few years. AMD earns a lower gross margin than many of its competitors, suggesting that they hold more pricing power. NVDA, for example, has invested billions in building a software ecosystem for its chips. This software can only run on Nvidia’s GPUs, and enables Nvidia to sell each chip at higher prices. And it’s not just profits; AMD hasn’t posted positive free cash flow on an annual basis since 2011, either. I think the game is stacked against Advanced Micro Devices. Its competitors, including Intel, enjoy stronger balance sheets, and could probably last longer in a price war, which will bleed them dry. They also have more money to invest in strengthening their software ecosystems. Many hope that new technologies such as deep learning can fuel GPU sales at AMD and Nvidia, but it looks like this field is getting ever more crowded. Now Fujitsu Ltd (ADR) (OTCMKTS:FJTSY) is entering the market with its Deep Learning Unit. And Apple Inc. (NASDAQ:AAPL) will begin making its own GPUs rather than buying them from Nvidia or AMD. Despite excellent products such as its Ryzen line, I don’t see Advanced Micro’s situation improving in the near future. The industry appears to be in a state of flux, with competition only increasing. Nvidia and AMD stock trade at very high valuations, and those valuations have scared value-minded investors like me away from buying the stock. AMD is also very cyclical, and volatile with a beta of 2.69. A long-term debt-to-equity ratio of 3.44 doesn’t make me comfortable, either; a bear market would hit shares hard. Intel — an established chipmaker with a track record of generating profits year after year — trades at more reasonable valuations, but expects greater competition from AMD and Nvidia. Intel thinks chip prices will decline as a result of AMD releasing its Ryzen CPU. Meanwhile, Samsung Electronics (OTCMKTS:SSNLF) may recently have removed Intel from its position as the world’s No. 1 semiconductor company. Qualcomm, Inc. (NASDAQ:QCOM) is sidelined, too, embroiled in a patent infringement lawsuit with Apple, alleging that Apple used its technology without paying royalties. Chipmakers also face the risk of their customers, including Apple and Samsung, deciding to produce their own chips in-house. The next few years will probably be very interesting for the industry, but I think I’ll steer clear of AMD stock — and the rest of the space — for now. 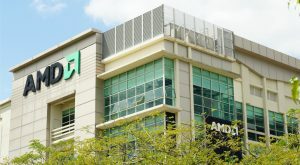 Article printed from InvestorPlace Media, https://investorplace.com/2017/08/will-advanced-micro-devices-inc-amd-stock-ever-post-regular-profits/.